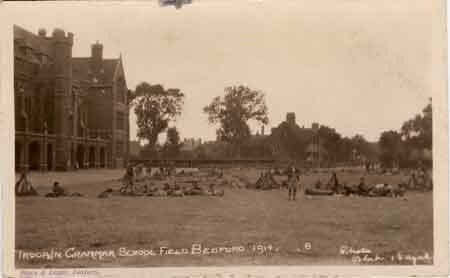 Wednesday 6th January 1915: There have been a number of casualties among the Old Boys of Bedford Grammar School serving at the Front. David Inglis, a Captain in the 4th Gurkha Rifles was killed in action on 21st December 1914 and Captain M.K.Sandys was killed leading an attack on a trench at Le Touquet, near Armentieres. Captain Peter “Pat” Benson Maxwell went to France with the East Yorkshire Regiment on 7th September and was severely wounded in the Aisne Valley on the 20th of the same month. He managed to crawl back to the trenches and was taken to a Field Hospital where he passed away on the evening of 23rd September. Pat had married his wife Eileen, daughter of Major-General Hamilton Gordon in 1912 and leaves a daughter, Joan, aged 14 months. In more cheerful news Second Lieutenant G.G.R.Williams of the Loyal North Lancashire Regiment, who had been reported wounded and missing in East Africa, has now been reported to be a prisoner and is said to be doing well. Another Old Boy is serving in the South Atlantic on H.M.S.Canopus. On 1st November he took part in the Battleof Coronel off the coast of Chile where the Royal Navy was defeated by Vice-Admiral Graf Maximilian von Spee. H.M.S.Canopus then returned to defend the Falkland Islands, which at first the fleet feared were already under German occupation and which were at grave risk. On December 7th a fleet of reinforcements arrived; when they engaged the Germans the next day they won a splendid victory. Our correspondent says “it is fine to have been in action, and you should have seen them scoot”. The Canopus is now full of German prisoners. 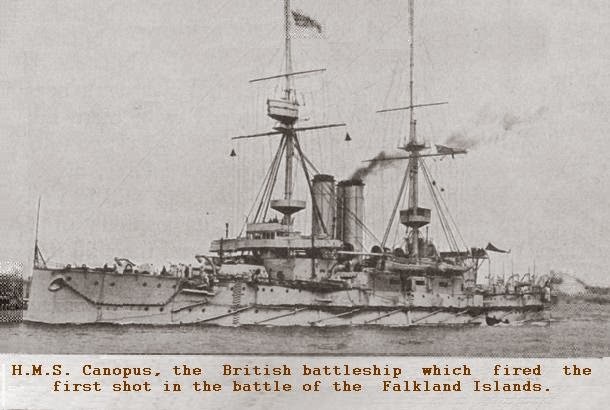 At the Battle of the Falklands all but two of the German ships were sunk. German casualties included Admiral Spee and his two sons.